With the Account page, connecting your Mish account couldn't be any easier! Let's walk through the steps you'll need to take. Go to your Accounts page. 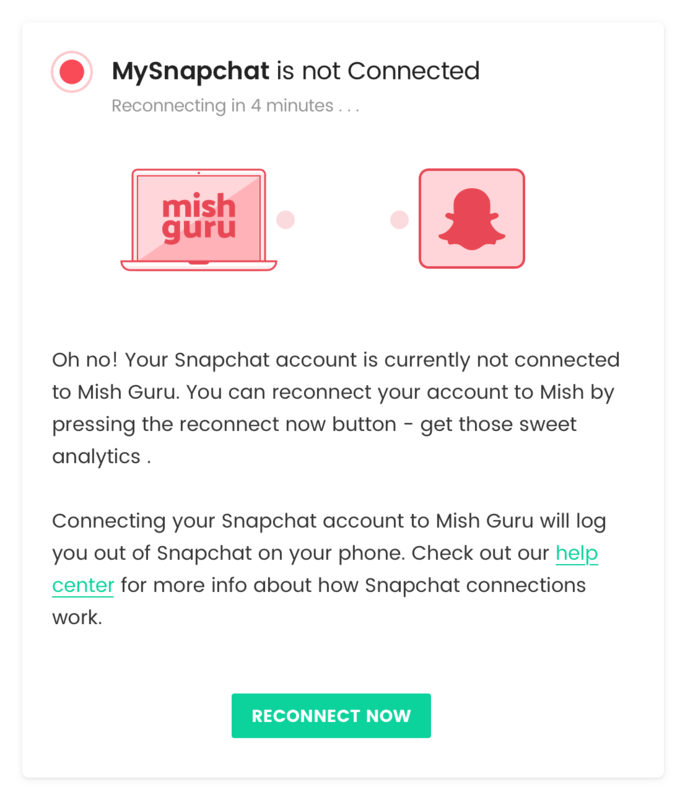 If your account is activated (which it will be after you've gone through an onboarding), it will look like this when you aren't connected to Mish. 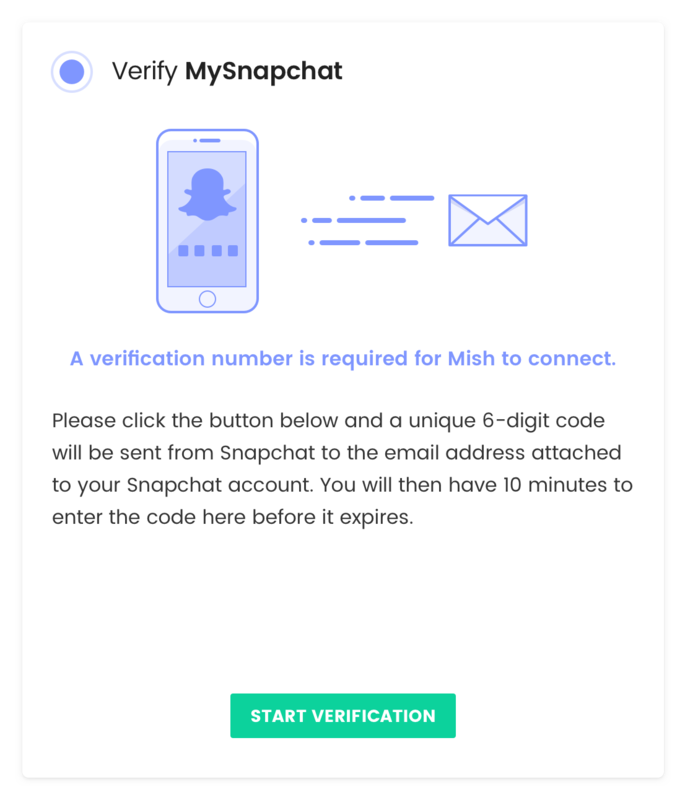 Remember, our software refires every ten minutes, so it's possible for you to log into your Snapchat account on your phone and for Mish to still think we're connected for a bit. Once the software refires, it will reflect the disconnected status. ...voila, you're in! Happy Mishing! 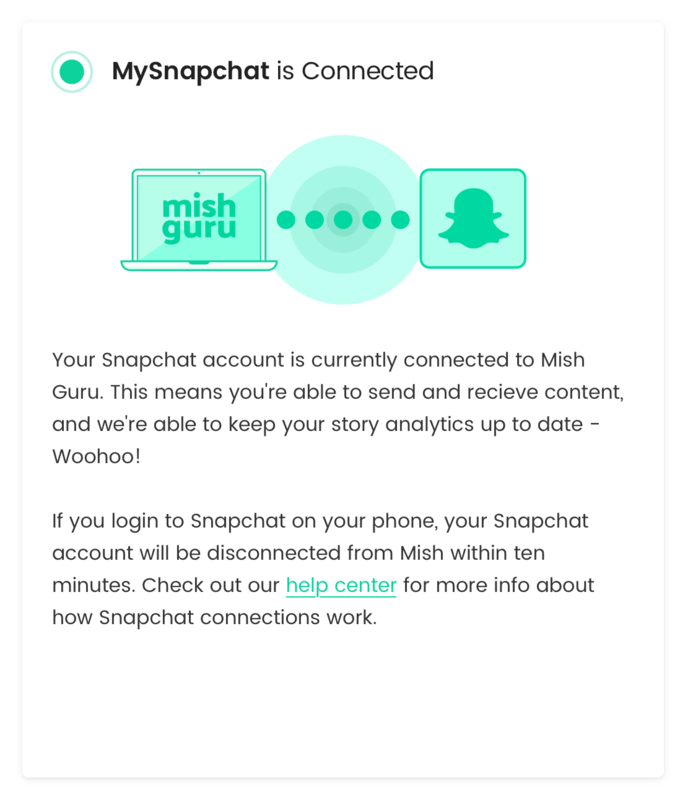 Due to Snapchat's increased security features, sometimes, we'll have to jump through an additional hoop to confirm to Snap that connecting Mish is what you wanna do. If your reconnection attempt fails due to a verification request, you'll see this screen. 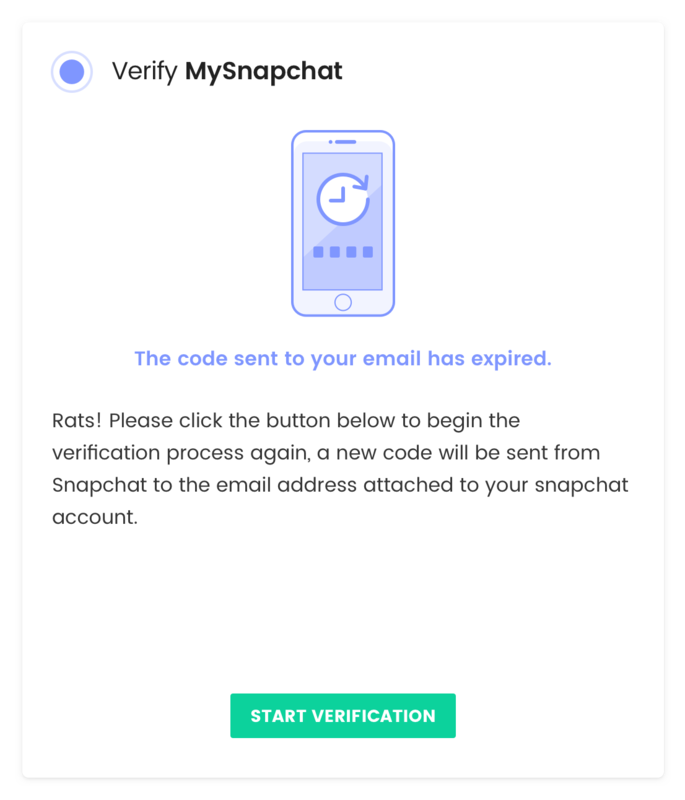 You'll receive a verification code to the email associated with your Snapchat account. Reminder: Make sure that the email associated with your Snapchat account is up to date! Team leads change, and it can be easy to lose track of this step in the shuffle, but keeping on top of this will help keep things running smoothly! Enter the code you receive into the boxes, and click "Verify Login." You can see we're trying the code from this page. If you've entered the code correctly and the deadline hasn't passed, reconnection should be a breeze! You may ask, "What happens if I had to step away and feed my dog and so the deadline for entering the code has passed?" No sweat. We'll let you know that the deadline has passed, and you'll be able to request another verification token. Simply click "Start Verification" again, and you'll get another countdown. Just make sure, though, that you enter in the most recent token sent! We all make mistakes from time to time. If you type in the wrong token, you'll just get kicked back to the countdown again! Simply re-enter the token correctly, and everything should be quite fine! 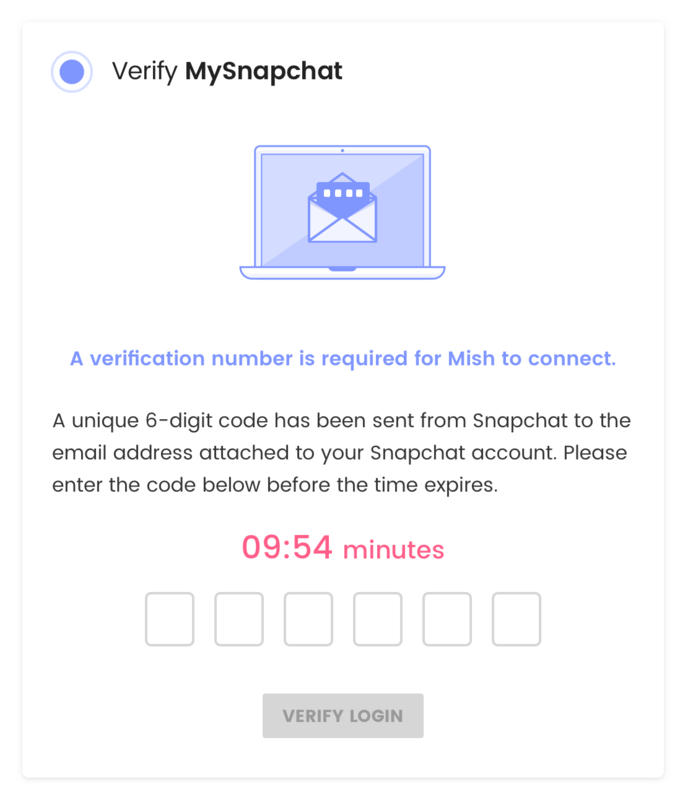 Whether you changed your snapchat password and forgot to enter it into Mish, or your fingers slipped when you were typing it in, a bad password means we aren't going to be allowed to enter your Snapchat clubhouse. You'll see this screen. 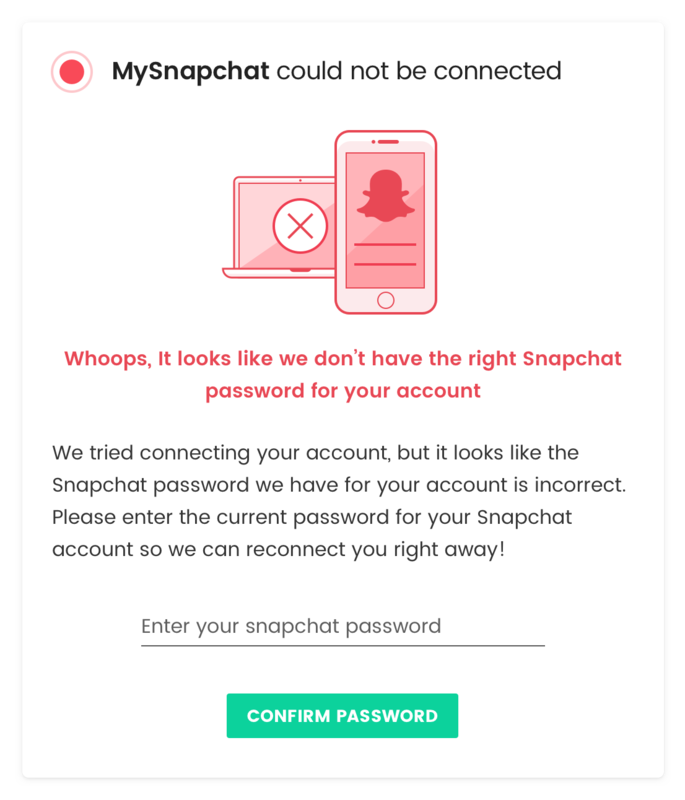 Simply enter your correct Snapchat password in the field, click "Confirm Password", and you should be reconnected in no time. Hopefully this guide can help you navigate reconnection so that you and your crew can continue to build wonderful stories, seamlessly. If you have any questions about this process, we're always here to help you out–so drop us a line, and we'll dig in together!